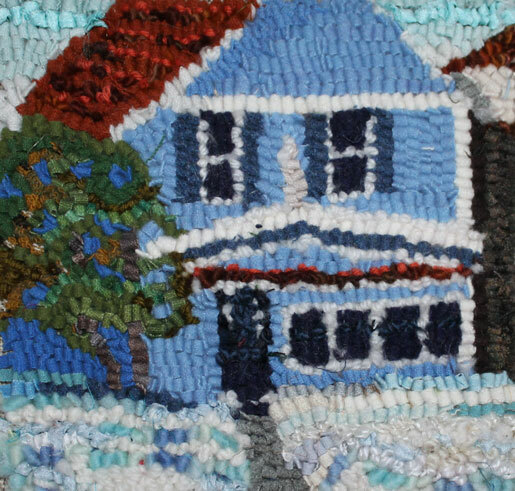 I am hoping to be a part of an Plein Air rug hooking group. Plein Air means in plain air, or outside ‘real life as you see it’ hooking. That is a little hard to do in February in Saskatchewan, what with it being -30 C including wind chill. So I am sitting inside looking out my windows and hooking winter scenery now. It is a good challenge and one I highly recommend for rug hookers. It trains your eye to narrow down and simplify. It requires going back to the same place day after day, or hooking very small pieces, or hooking very fast. It also requires making do with the wool strips (known as worms) you have with you if you are outside. Being inside I have the advantage of going to my stash for “the right colour”. Lori LaBerge created this group for rug hookers and we are, as a group, creating a body of work for an upcoming issue of the online magazine Rug Beat. Keep your eyes open for it and check out the web pages of the other group members.